(142014) Neirinck = 2002 PA168 Discovered 2002 Aug. 8 by NEAT at Palomar. French-born Pierre Neirinck (b. 1926) headed the Satellite Orbits Group at Appleton Laboratory in the U.K. during the 1970s. Now retired, he still coordinates the international amateur satellite observations. The name was suggested by M. Langbroek. Pierre Neirinck is a veteran satellite observer and analyst. As an active French observer from the dawn of the space age, he was recruited by the British satellite research analyst Hele-King, and headed the British Orbital Analysis Group from the early seventies until his early retirement. Now 82 years old, he still actively observes, and coordinates amateur satellite observations. He provides new Cospar designations to new observers, and daily sends bulletins updating the orbits of some of the more interesting satellites (notably the KeyHoles). His daily reports are a delight to read, not only because of the orbit analysis, but also because they always contain an ironic, sometimes even cynic commentary on current affairs in this world. Amongst others, he keeps a dedicated tally of the number of people that depart our planet in violent ways each day. (142014) Neirinck was discovered by me in archived images of the NEAT project from 8 August 2002 (and surrounding nights) taken by the 1.2 meter Schmidt telescope of the project at Mount Palomar. 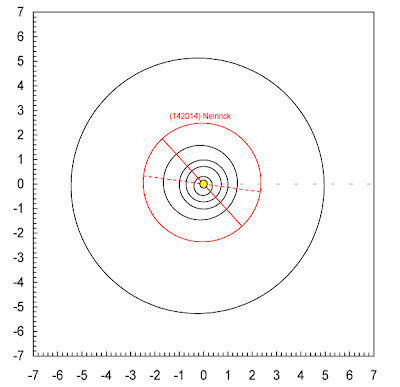 With H=16.9, it is estimated to be about 1.5 kilometers in diameter. It completes an orbit around the sun each 3.8 years. 132820 Miskotte Discovered 2002 Aug. 17 by NEAT at Palomar. Koen Miskotte (b. 1962) is a Dutch confectioner and amateur astronomer whose main interests lie in meteor astronomy. He is a very prolific meteor observer, active within the Dutch Meteor Society. The name was suggested by M. Langbroek. Koen is a very close friend of mine, and we have travelled the world and observed meteor showers together many times. He is a dedicated, extremely active meteor observer for many decades now, and has contributed data to several scientific meteor studies. 179678 Rietmeijer Discovered 2002 Aug. 26 by NEAT at Palomar. Frans J.M. Rietmeijer (b. 1949) is a Dutch-born planetary geologist specializing on interplanetary dust particles. He is a research professor at the University of New Mexico. The name was suggested by M. Langbroek. Frans, a renowned expert scientist on IDP's, is a close friend too, even though he lives at distance in New Mexico. We met 10 years ago through my meteor/meteorite related activities and soon developed a personal friendship. Whenever Frans is briefly in the Netherlands again we meet for a dinner. He has acted as my older & wiser mentor in science career related business. 132798 Kürti Discovered 2002 Aug. 8 by NEAT at Palomar. Stefan Kürti (b. 1960) is a Slovakian amateur astronomer with a focus on minor planets. Among his discoveries are two near-earth objects. The name was suggested by M. Langbroek. Stefan was in the Spacewatch FMO project with me, and is an active asteroid hunter. He surprised me last summer by naming one of his finds after me.